Cyprus Property Blog by Cleo : Secret Valley Property - Pool, Fully Furnished, Garden - New on the Market! Secret Valley , Paphos - This beautiful 3 bedroom detached villa is located in the prestigious residential development of Secret Valley, next to Secret Valley Golf Club. It is an easy 15 minute drive from Paphos and is situated on unspoilt coastline near to Aphrodite's Rock and Birthplace. The nearest beach is 5 minutes’ away and about the same distance from Secret Valley Golf Club and Aphrodite Hills Golf and Leisure complex. The ground floor features a spacious open plan lounge, dining area, kitchen, and a guest toilet. Patio doors lead from both the lounge and dining area to a covered veranda which spans the front of the house, and overlooks the mature front garden. The fully fitted kitchen with breakfast bar and granite worktops is impressive, and well equipped with built-in oven, hob, extractor, fridge/freezer and washing machine. A staircase leads up to a spacious hallway and three double size bedrooms all with fitted wardrobes. Patio doors in the master bedroom open onto a good size covered balcony with attractive archway, and from here there are stunning sea views. There is a spacious en-suite shower room and bedroom two and three share a large family bathroom. At the side of the property there is plenty of space for relaxing around the swimming pool and enjoying the lovely sea views and sunsets. Outdoor dining is made easy with the built-in outdoor barbecue/grill. At the rear of the property is a gated driveway providing ample parking space for two cars, and landscaped gardens with fruit trees. 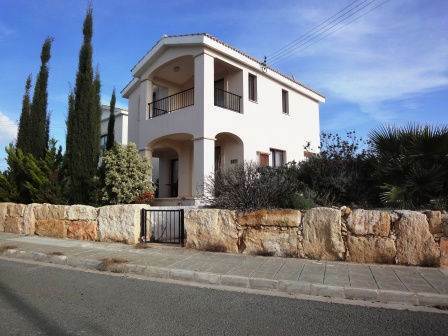 This property is ideal for residential or holiday use and comes fully furnished.